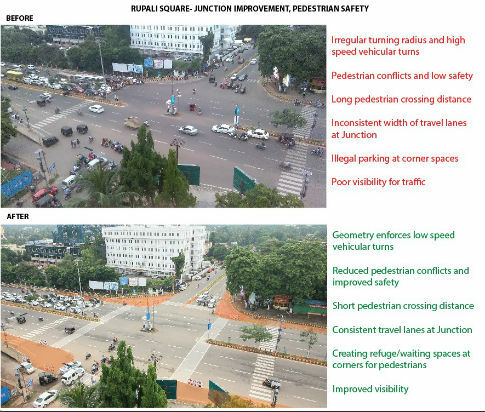 Bhubaneswar: The demonstrative road safety and junction design improvements carried out by BDA, BMC along with Bhubaneswar Urban Knowledge Centre and WRI India, at Rupali Square traffic junction on a pilot basis has received mixed response from both the commuters and stakeholders. The temporary improvements such as traffic bulb-outs, advanced pedestrian crossing marks were created by putting barricades, traffic cones and ropes along with splashes of colour put in place on the intervening night of 4th and 5th August in order to ensuring safe pedestrian movement at the junction. Major traffic hurdles at the junction were speeding at turns, wrong side driving in the extra space, pedestrians walking longer distances at crossing, no waiting or standing place for pedestrians risking their crossing of the junction and overtaking due to increased road width. As part of geometrical correction measures at the junction in order to overcome some of the major issues faced by pedestrians, the BUKC-WRI India team in coordination with city agencies BDA, BMC and Twin City Commissionerate of Police, traffic bulb-outs for pedestrians were created at all the four directions along with pedestrians’ crossing markings with paint, barricades and traffic cones. On the intervening night of 4th and 5th August, a team of around 30 persons including urban planners, transport planners and professionals from BUKC, WRI India along with a team of city-based artist groups created these improvements at the junction. Though the several hours of heavy rains in early morning on 5th August took some shine off the colourful art created in the bulb-outs, the tactical interventions for pedestrian movement was tested during last three days, monitoring traffic movement and flow. 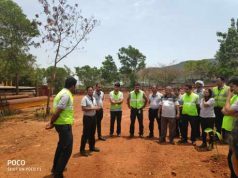 BUKC-WRI India team held briefing sessions for the traffic cops and traffic volunteers posted at Rupali Square, explaining them the thought behind the short-term improvements and required enforcement measures to optimise use of the facilities by pedestrians. The change in road geometry by maintaining consistent travel lanes at the junction and creation of bulb-outs in all four sides has minimised illegal parking and wrong side driving in extra space along with enhancing visibility for traffic. Based on the observation of traffic flow, movement and testing of the recent improvements over last three days, it has been decided to create further awareness among public, especially pedestrians on the facilities created for their convenience in crossing the junction. The traffic volunteers and cops have also been briefed accordingly. Based on the analysis and experience, it has also been planned to give the pedestrian crossing marks a distinct look so that pedestrians can easily understand and use the safe passage at the junction. It has also been decided to monitor the traffic movement and flow for few more days before making small changes or altercations in the road safety improvements keeping in view that the traffic movement at the junction is usually thinner in week-ends and holidays. As per a junction volume survey carried out by Bhubaneswar Urban Knowledge Centre (BUKC) of BDA in January 2017, during peak hours the Rupali Square junction receives around 7,500 vehicles (all types) and witnesses around 250 pedestrians crossing the junction every hour from all the four directions. It may be noted here that as part of Bhubaneswar Urban Lecture Series, BUKC with BDA and BMC organised a workshop on ‘Road Safety Improvement – Lighter, Quicker and Cheaper (LQC) approach’ on 4th and 5th August 2017 wherein officials of different departments, city agencies and domain experts along with child leaders and artist groups deliberated on road safety improvement measures.